So, you've chosen the perfect hamster and brought everything you need to care for it. You've taken them home, have sat for the past two days talking to and watching your pet, and now you think you're ready to begin taming your hamster. Only, you're not sure about where to start or how to go about it. You may think that taming hamsters is difficult and time consuming. It can be frustrating too at times when you feel like you're getting nowhere and are ready to take the hamster back. It is vital to have patient and to be considerate of your hamster's feelings. From the hamster's point of view you are a strange new creature who has taken them from the only home they know. They are in an alien environment and it will take time for them to get used to it. Very few hamsters are completely comfortable with a new place from the start. It depends entirely on the animal, just like people, hamsters have their own personalities and temperaments. The hamster taming process should take place in the evening or at night. Getting to know your hamster is the first step to taming them. Begin by talking to your hamster while they are in their cage and playing. You can give them a treat through the bar each time you sit and talk to them so that they understand that you mean no harm. The next step is to take the lid off the cage and sit the cage on a bed, making ridges so the hamster can't escape easily and fall, or put the cage somewhere that you can catch the hamster easily like an enclosed room or conservatory. Wear gloves if you are nervous about the hamster biting, as this will increase your confidence and make the hamster more confident too. 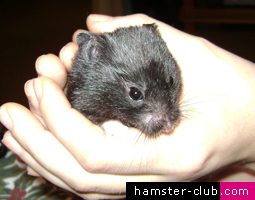 If you are nervous, the hamster will sense this and become anxious too and easily frightened. Once you are sat comfortably near the hamster's cage, let the hamster sniff your hand and offer it a treat. Talk to them for a while and stroke their back gently if they seem calm. If they get scared, stop and put the lid back on. Let them calm down then try again. It is best not too spook the hamster when trying to make friends with it. As the hamster becomes used to you, you should be able to put your hand in the cage and the hamster may climb onto it to eat some food. Do not lift your hand to start with but just let the hamster become used to sitting on your hand. When you feel more confident you can try scooping up the hamster gently using two hands. 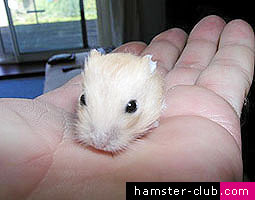 Scoop up the hamster so that they are facing you and know what is happening, otherwise they can become scared and run. Keep handling your hamster until you feel comfortable enough to take off the gloves, if you have worn them, or feel that you and the hamster have become friends. Then you should be able to lift the hamster out of the cage, where ever the cage is kept, and take the hamster to see new places. Repeating the same routine will help facilitate the hamster taming process, but do note that the hamster taming process differs from hamster to hamster. Taming one hamster may be more time consuming than taming another hamster. Taming a hamster may take days or months, depending on the hamster's character. It may be a time consuming process and can result in bitten fingers, but it is very much worth it when you see the end result. A tamed hamster should be cuddly, eager to see you and inquisitive about their surroundings. Hamsters are curious by nature and love to explore. Try showing your hamster the stairs and watch them climb up and down. Sofa's are a good place to handle hamsters as there is plenty of room for the hamster to run and you can keep a close eye on them at the same time.